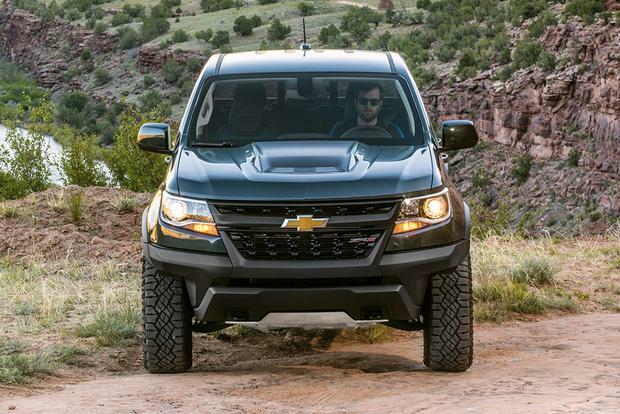 The 2019 Chevrolet Colorado offers full size pickup features, capabilities and looks, but at a lower price and with a smaller footprint. 2019 Chevrolet Silverado vs. 2019 Chevrolet Colorado: What's the Difference? The Silverado is a larger, more capable and more refined vehicle than the Colorado. This Chevy Colorado is one of the craziest SEMA builds I've seen come up for sale. 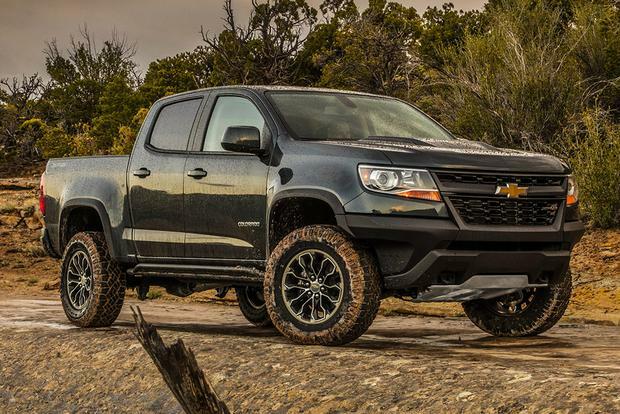 2019 Chevrolet Colorado ZR2 Bison: Why? 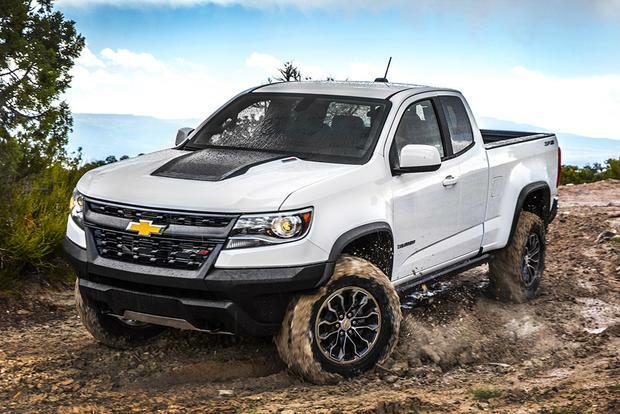 Building on its Colorado ZR2, Chevrolet brings an even more capable truck to market in the 2019 Colorado ZR2 Bison. We've listed March's best truck deals for shoppers interested in getting a new pickup at a great price. 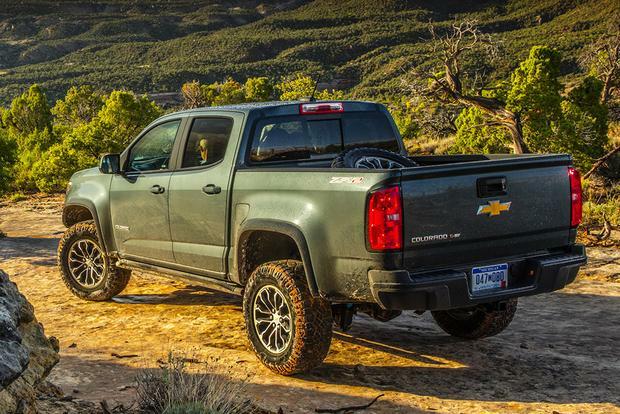 The 2018 Chevrolet Colorado has proven to be a sales success for GM, filling a major demand for a midsize truck with good fuel economy and a reasonable price that's still capable of accomplishing big chores. In fact, with the Ford Ranger still a no-show and Dodge offering nothing at all, the Colorado's only real competition comes from the aging Nissan Frontier and Toyota Tacoma, the latter still a formidable rival. There's also the Honda Ridgeline to consider. It offers many desirable features but not the power, towing ability or off-road expertise of the Colorado. In fact, none of the Colorado's rivals can match its 7,600-lb max tow rating or optional diesel engine, and stylistically the Colorado is pretty much on the cutting edge of pickup truck design. In fact, now that the Colorado and its GMC Canyon twin are plentiful on dealer lots, it's hard to see why you'd buy another midsize truck. The Colorado offers three engines. In base models, there's a 200-horsepower 2.5-liter 4-cylinder that makes 191 lb-ft of torque. Two transmissions are offered: a 6-speed manual, available only with rear-wheel drive, that gets 20 miles per gallon in the city and 26 mpg on the highway, or a 6-speed automatic that's offered in rear- or 4-wheel-drive versions. Automatic versions return 20 mpg city/26 mpg hwy with rear-wheel drive or 19 mpg city/24 mpg hwy with 4-wheel drive (19/22 for the ZR2). The 2.8-liter turbodiesel 4-cylinder makes 181 hp and a bulky 369 lb-ft of torque. Fuel economy for the rear-wheel-drive model is a very respectable 22 mpg city/30 mpg hwy, while the 4-wheel-drive version earns a slightly lower 20 mpg city/28 mpg hwy. If you're looking for more power, the Colorado also offers a 3.6-liter V6 that makes 308 hp and 275 lb-ft of torque. That engine returns 18 mpg city/25 mpg hwy with rear-wheel drive or 17 mpg city/24 mpg hwy with 4-wheel drive (16/18 for the ZR2). The Colorado is offered in five trim levels: a base model called simply the Colorado, a slightly more upscale WT model (for Work Truck), a midlevel LT and the off-road-oriented Z71 and ZR2. The base-level Colorado ($21,390), which is only offered in rear-wheel drive with a 6-speed manual transmission and no rear seats, features anti-lock brakes, a backup camera, 7-in MyLink radio, USB ports, Bluetooth, Apple CarPlay and Android Auto compatibility, air conditioning, a power driver's seat and power windows. Step up to the Colorado WT ($24,870, Extended Cab; $27,425, Crew Cab), and you'll add rear seats, along with some new options. Crew Cab models get a 6-speed automatic, while the 3.6-liter V6, an available 8-speed automatic transmission and 4-wheel drive remain optional. 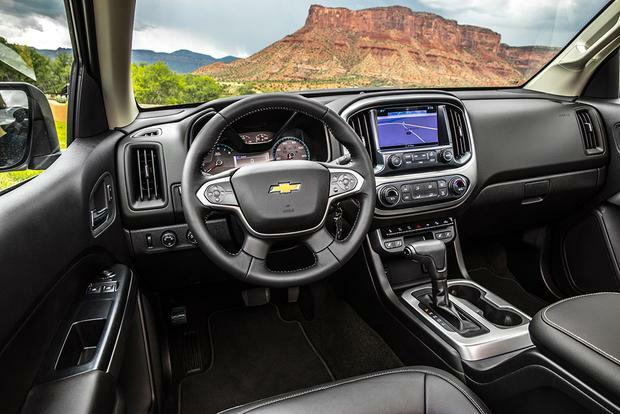 Next in line is the Colorado LT ($28,625, Extended Cab; $30,205, Crew Cab), which features a standard automatic transmission, GM's 4G Wi-Fi hotspot, 17-in alloy wheels, Chevrolet's MyLink infotainment system with an 8-in color touchscreen, remote keyless entry, cruise control, satellite radio, a leather-wrapped steering wheel and steering wheel audio controls. Topping the range is the off-road-oriented Z71 ($30,860, Extended Cab; $32,780 Crew Cab), which boasts an off-road suspension, hill-descent control, a remote starter, a power passenger seat, front tow hooks, an automatic locking rear differential and automatic climate control. The ZR2 ($41,550, Extended Cab; $43,175 Crew Cab) offers unique interior and exterior styling cues, an off-road suspension with Multimatic shocks, front and rear electronic locking differentials, more aggressive approach and departure angles, 17-in off-road wheels and tires, an additional 2-in front and rear lift, a 3.5-in wider stance and skid-plate protection. Options include high-tech safety features such as a lane-departure warning system and forward-collision alert, along with convenience items, including a navigation system, a Bose sound system and an innovative in-bed cargo divider. Engine choices include the 3.6-liter V6, offered on all but the base-level Colorado model, and the 2.8-liter turbodiesel, which is only available in LT, Z71 and ZR2 trims at a price premium of more than $3,000 over the V6. All 2018 Chevrolet Colorado models come standard with dual front-side airbags, along with side-curtain airbags for front and rear occupants. The Colorado also includes a standard backup camera and traction control. Options include forward-collision alert and a lane-departure warning system. In crash testing carried out by the federal government, the Colorado earned a so-so 4-star score, including a 3-star rating in the National Highway Traffic Safety Administration's rollover assessment and five stars in the side-impact test. The Insurance Institute for Highway Safety gives the Extended Cab model a Good rating in its moderate-overlap front and roof strength crash test and Acceptable in the small-overlap front and side impact crash test. The Colorado Crew Cab does much better with a Good rating in all crash test categories. 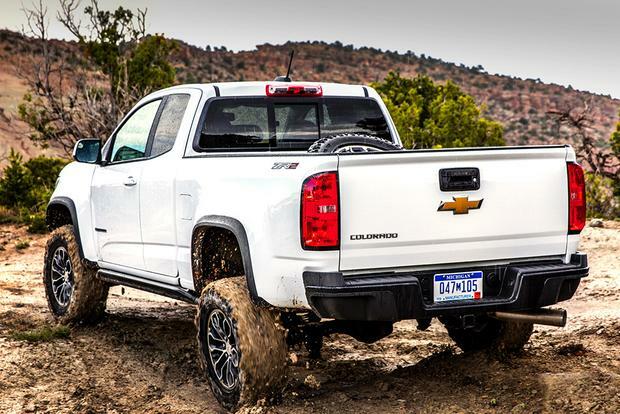 The Colorado is simply a major step up over all its small-pickup competitors. One reason is the truck's ride, which is much smoother than what you'll find in other pickups. The interior is also nicer, and the Colorado and Canyon boast more gadgets and features than the Nissan Frontier and Toyota Tacoma. To us, the Colorado and the Canyon look more modern on the outside, too. While the base-level Colorado's 4-cylinder isn't a major workhorse, it's certainly acceptable for many situations -- and it gets strong fuel economy for a pickup truck. But we're especially impressed with the pickup's V6, which is the power plant we recommend. It boasts excellent acceleration and a surprisingly brawny 7,000-lb towing capacity (7,600 with the diesel), along with a smooth standard automatic transmission. We have only two complaints with the Colorado. Its ride, while great for a small pickup, could still be a little better. And we're not sold on the front seats, which could use a little extra support. 2018 GMC Canyon -- The GMC Canyon and Chevrolet Colorado are highly similar in a lot of ways, especially under the hood. You should check out both trucks to see which one you prefer -- and which is available with a better deal. 2018 Toyota Tacoma -- The Tacoma offers notorious Toyota reliability and a loyal following. However, the Colorado's engines are more powerful across the board, and Toyota doesn't offer a diesel engine option. The Tacoma TRD Pro V6 doesn't offer the same advanced suspension or locking front/rear differentials found on the new ZR2. 2018 Nissan Frontier -- The Frontier is an aging pickup that can't really compete with the Colorado's engines, equipment or design. This might be acceptable if the Frontier cost thousands less, but it can't even offer that. 2018 Honda Ridgeline -- The Ridgeline isn't as heavy duty as the Colorado, but it does offer a car-like ride, legendary Honda build quality, a robust V6 engine and unique features like an underbed storage compartment. Used Chevrolet Silverado -- If you need more capability, more power or just a larger truck, consider Chevrolet's larger Silverado pickup. Pricing is higher, though, so you may want to look into a used model. We'd go for a V6-powered Colorado LT with a few extra options, such as lane-departure warning and forward-collision alert. It's the best of all worlds: You get a brand-new truck with a muscular engine, a lot of equipment and excellent capabilities that outshine those of other small-pickup rivals -- all for well under $30,000 with shipping. The diesel is appealing but too expensive for our tastes.